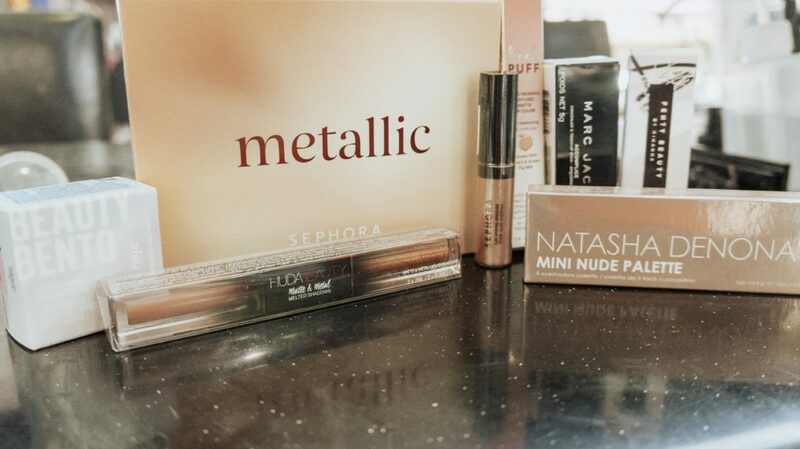 Sephora & Ulta Holiday Gift Guide! $15-$100! + gift card GIVEAWAY. Tonya and I picked our FAVORITE items perfect for stocking stuffers and gifts during this Holiday season. 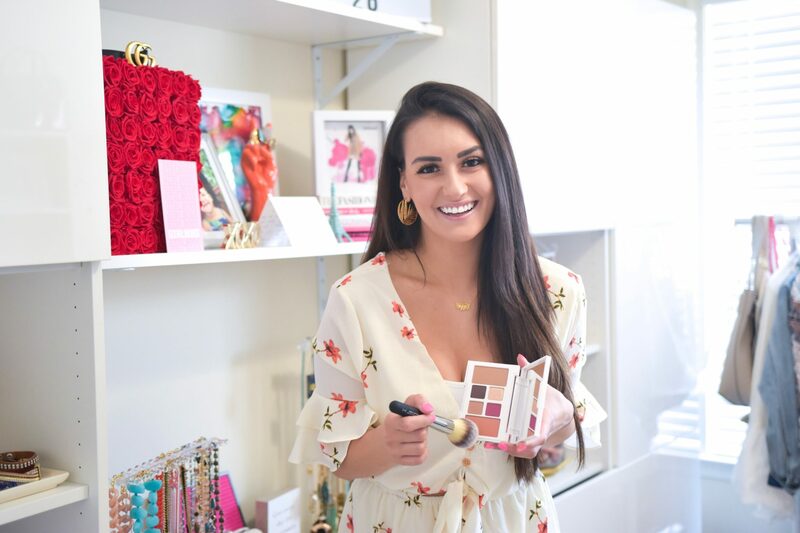 Below you will find gifts from Sephora and Ulta ranging from all different price points, whether it’s for your sorority sister or mother-in law! 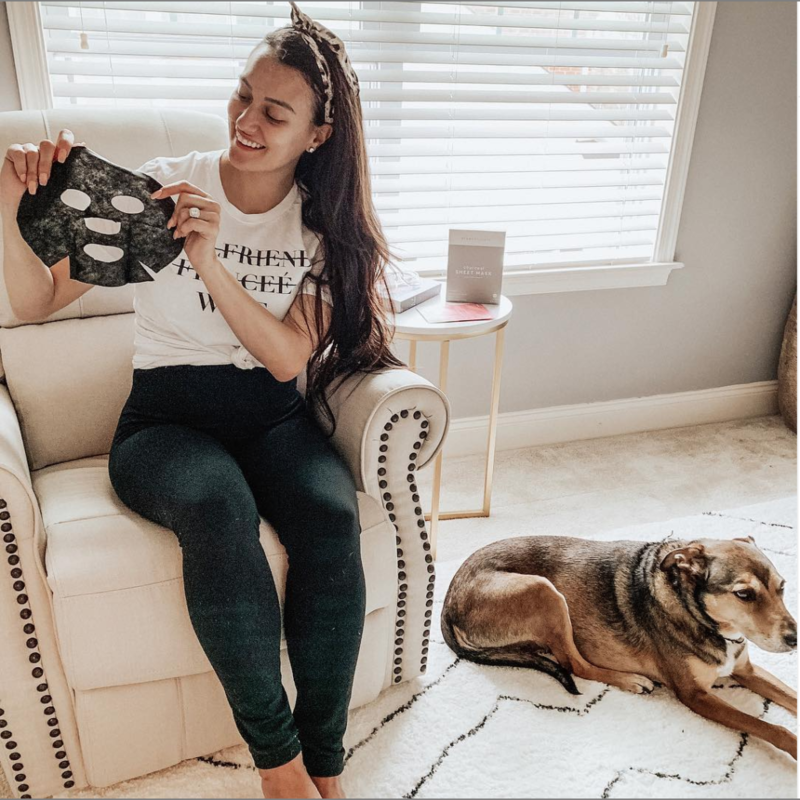 We will have more fun gift guides coming soon – perfect for your significant other, friends, and the one friend who loves to be comfy at home. 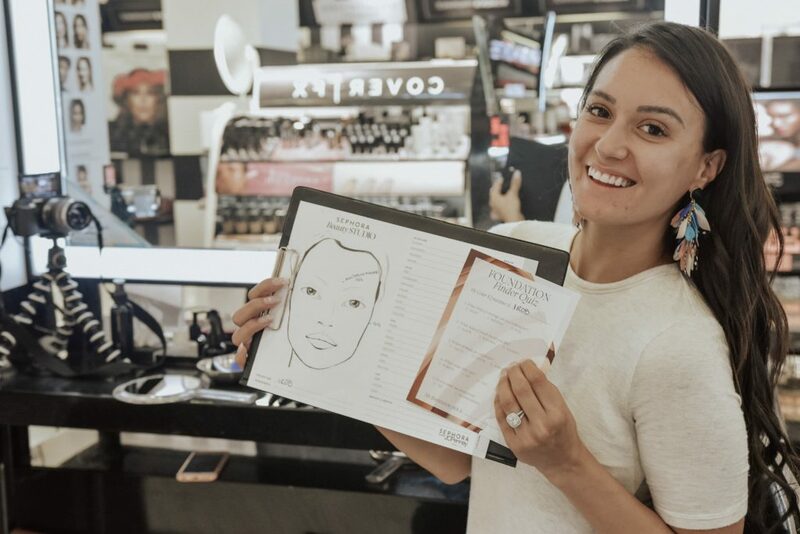 How to find the perfect foundation at Sephora Inside JCPenney! This blog post is sponsored by Sephora inside JCPenney. However, all thoughts and opinions are my own. 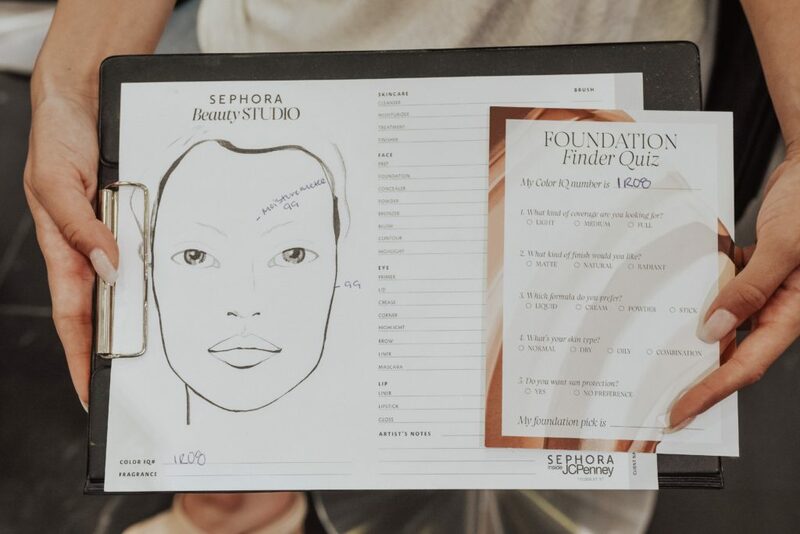 One of the most important parts of makeup application is finding a foundation shade that is right for you. There’s nothing worse than doing your makeup, leaving your house, only to have one of your friends point out that you didn’t blend your makeup well enough and you have a makeup line! 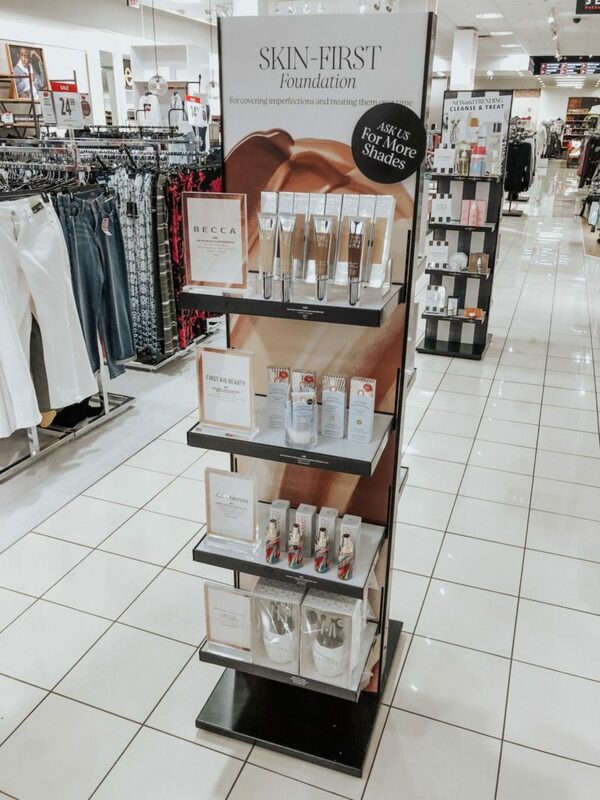 That’s why Sephora inside JCPenney has made it SO easy with their Color IQ true shade foundation match technology! 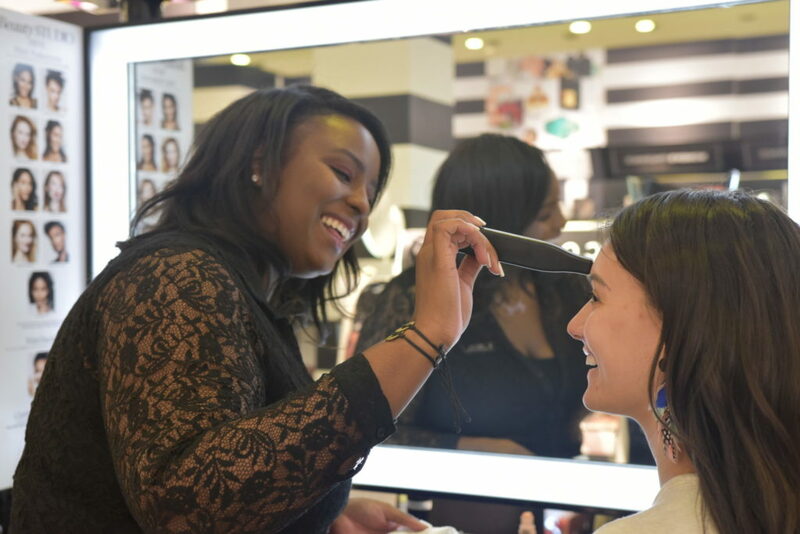 I met Avril, one of Sephora inside JCPenney’s Education Managers, at the Sephora inside JCPenney at the Woodmoore Towne Center in Lanham, Maryland. We first talked about my skin and what kind of skin I have. If you don’t know what kind of skin you have and you feel like every product you try isn’t right for your face, go to Sephora inside JCPenney immediately and get your skin analyzed with their Moisture Meter! The Moisture Meter measures hydration levels in your skin and gives you a number from 1-100, 100 being hydrated, one being not at all. I have naturally oily skin, which was confirmed by my 99 rating! 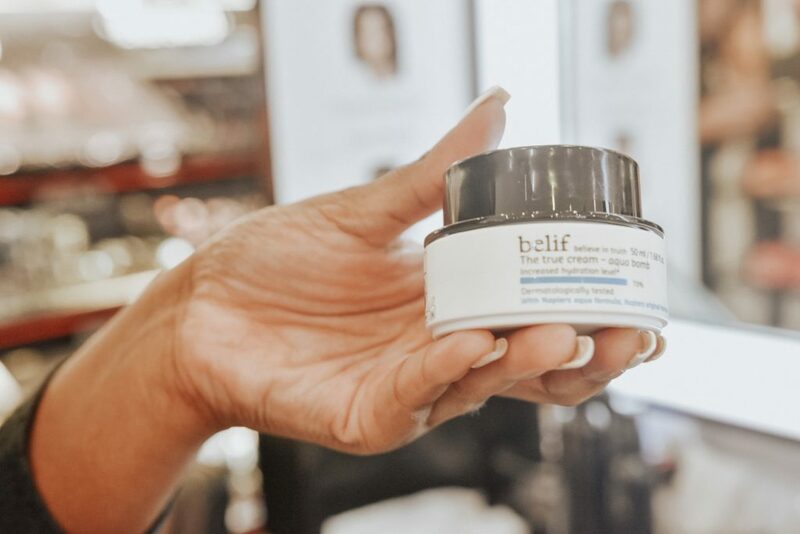 Based on my rating, Avril recommended Belif’s The True Cream–Aqua Bomb to keep my skin feeling hydrated all day long, and let me be the first to tell you that it is the best! Next, Avril brought out Sephora’s “Color IQ” reader. This is by far the coolest technology I’ve probably ever seen. Avril took pictures of my cheek, chin and forehead with the Color IQ reader and the machine automatically recommended foundations and shades customized just for me! No more harsh makeup lines or trying a million different shades until you find the right one! It’s that easy. I matched with the new BECCA Ultimate Coverage 24-Hour Foundation that went on so smoothly with the Sephora brushes Avril recommended: number 52 for concealer and number 88 for foundation. 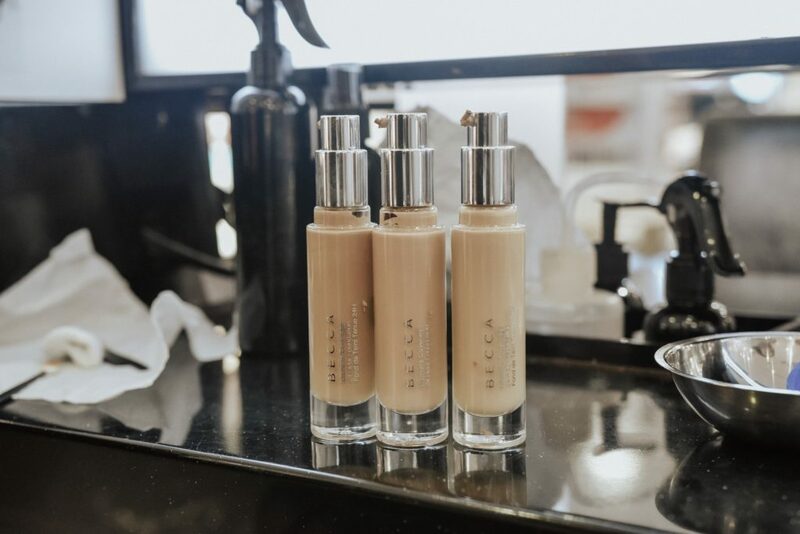 Additionally, the Color IQ technology also recommends a concealer that’s right for you. We used Make Up For Ever’s Full Cover concealer. It matched so perfectly, I couldn’t even tell it was on my face! Avril told me that’s how you know you’ve found your perfect shade, when you can’t see it! 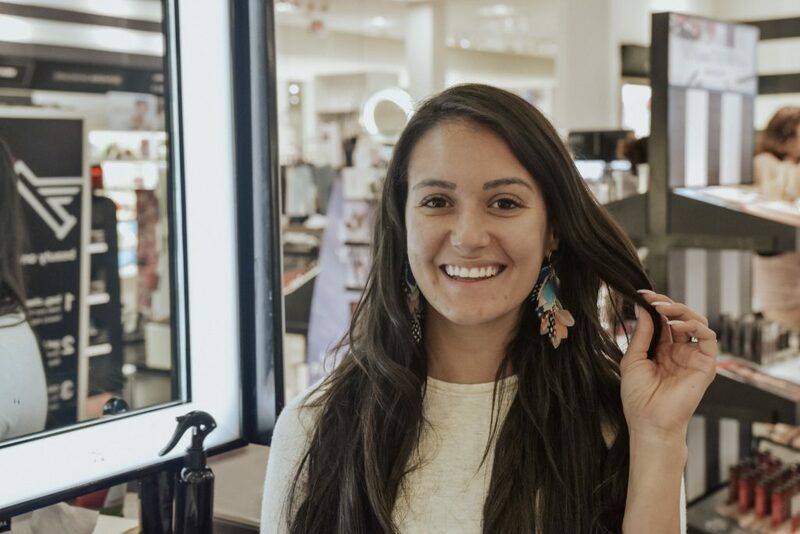 Don’t settle for foundation that’s just “okay.” Go to your local Sephora inside JCPenney and receive a free mini makeover to find your match. You don’t even need to make an appointment! Find your perfect foundation shade just like I did. You’ll even receive some free samples of other products to try. You’ll be so happy when you don’t notice those annoying makeup lines anymore! Click HERE to watch my YouTube video on the entire process! 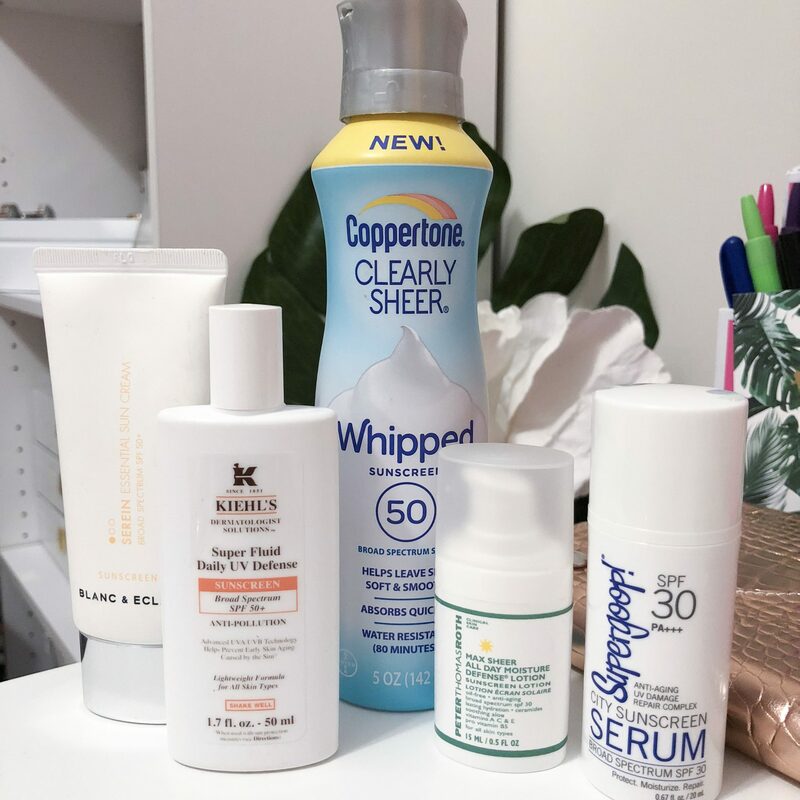 I’ve decided since I receive so many of the newest beauty products that I would start doing a weekly recap each week for you guys to let you know what just came out! So some of these below are NEW products on the market and also products I’m trying/seeing for the first time. Nars, Fresh, It Cosmetics, Bite Beauty, Too Faced, Lancome, Urban Decay, Neutrogena, ColourPop, Bath & Body Works. Urban Decay – NEW LO-FI Lip Mousse: Whipped to airy perfection, Lo-Fi Lip Mousse is a weightless, buildable, waterproof lip color. Lo-Fi provides high-impact color with a velvety soft finish that feels like you’re wearing nothing. I love that ultimately can use this as a blush and lipstick. Nars 7 Deadly Sins – Coming soon! Hasn’t hit stores yet. 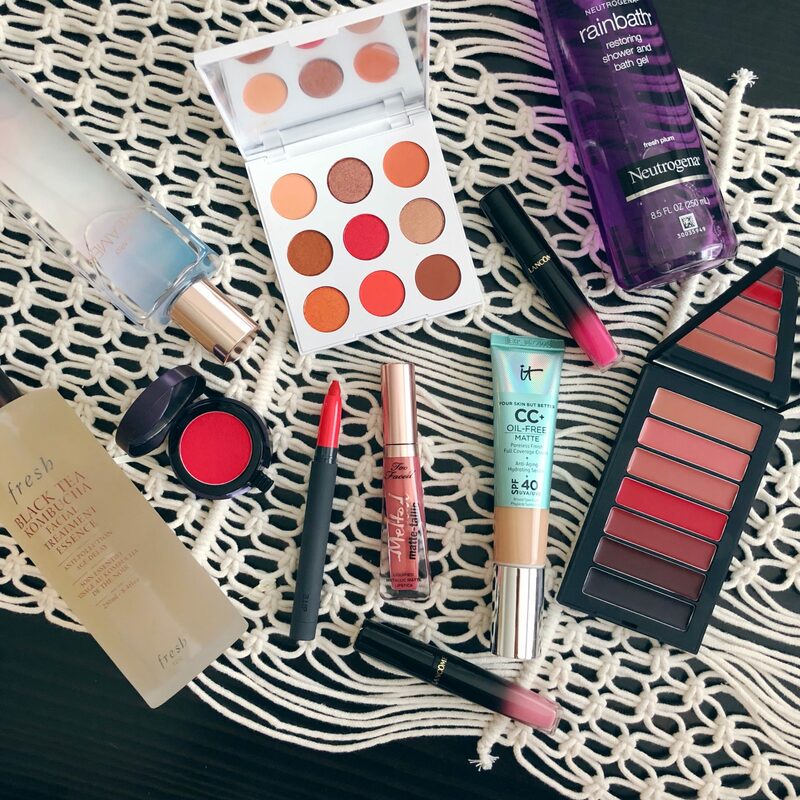 It’s perfect for traveling when you might need options and don’t feel like bringing 7+ lipsticks with you! 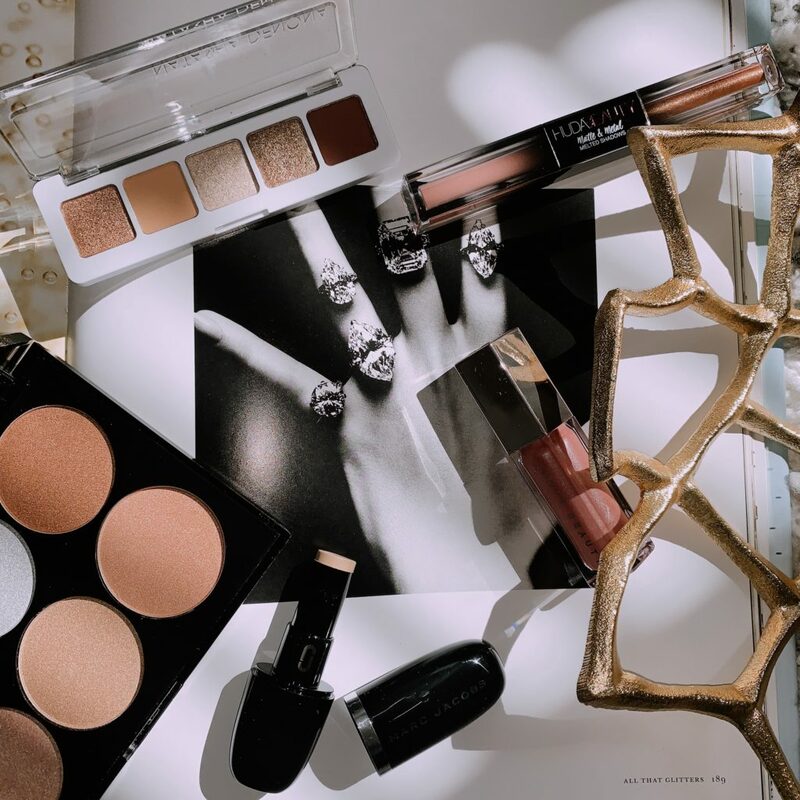 It Cosmetics – I’ve been a huge fan of this brand for a few years. 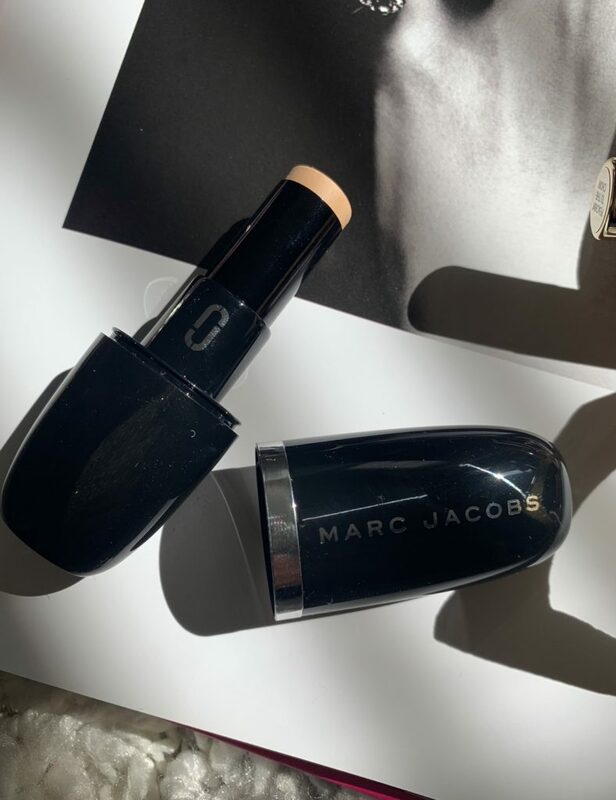 If you’re looking for a lightweight matte foundation – this is a must. I love how their products don’t CLOG your pores, I’ve had a lot of foundations in the past really end up hurting my skin. Bath & Body Works – Lovely Dreamer is one of their newest scents and I LOVE IT. Caroline was like “where is this from” and she couldn’t believe it! Right now it’s BUY 3 and get TWO free or BUY 2 and get 1 FREE. It’s a blend of fluffy musk, clean woods, white iris & fresh bergamot. Fresh – Black Tea Kombucha Facial Treatment Essence -fights pollution and signs of aging while increasing moisture and luminosity for a lustrous complexion. Too Faced – When these first arrived I thought they would be too “metallic” to wear day to day, but after swatching them I was wrong and pleasantly surprised. These would easily work for any look. I would love some more color options! ColourPop – 9 colors in this eye palette: New Digs: matte pastel peach, Anthem: metallic bright pinky copper, Dynamite: matte burnt orange, Hotel: metallic vivid copper, Motel: satin hot pinky coral, B+B: metallic pinky gold, Floaties: bright metallic orange, OOO: hot orange coral, Unwind: matte rich terracotta. Neutrogena – I dove into this body gel this weekend – the smell is amazing! Left my skin feeling soft and not dry. I get super dry after showering, even in the summer. I hope to try their other scents after I finish this one. I’ve always been a huge fan of their makeup wipes so I’m glad they are expanding their body line. Lacome- L’ABSOLU LACQUER GLOSS – These are the perfect buildable lipglosses – I personally love these because it depends on how much color you’d like you can apply more. Bite Beauty – Lip crayons. This brand is one that I tried years ago and have been a fan of their formulas! I personally like the lip crayons better than regular lipsticks cause of travel and I like the sleekness of it. Top 7 setting sprays you must have! Summer weather means hot summer temps that are not very makeup friendly…unless you have a great setting spray! I love setting sprays because I can go about my fun summer activities without having to constantly reapply my makeup. Of course, Urban Decay’s “All Nighter” setting spray is a no-brainer. It’s light and the spray nozzle makes applying it easily. My makeup will literally last all night when I wear this setting spray and it’s always been my go to! Even better, they also have a travel size spray that can fit in your purse or luggage to freshen up on the go. 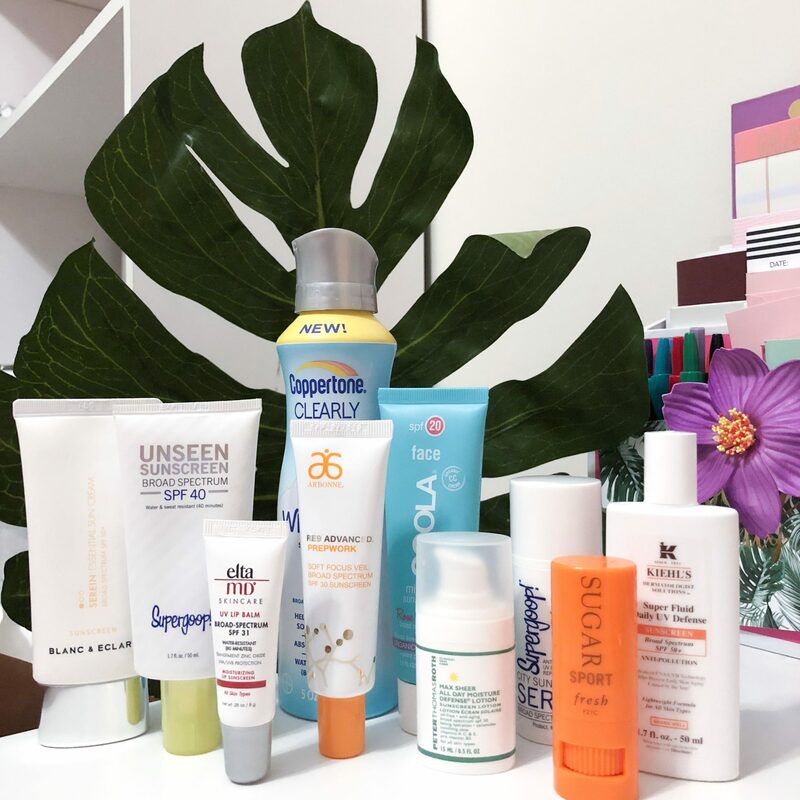 As I mentioned in my last post on SPFs, I absolutely love the brand Supergoop. Their three-in-one setting spray with rosemary is by far my favorite. It gives you a matte finish, smells amazing and has SPF 50 in it so it’s perfect for the beach or pool! Mac products are always high quality. 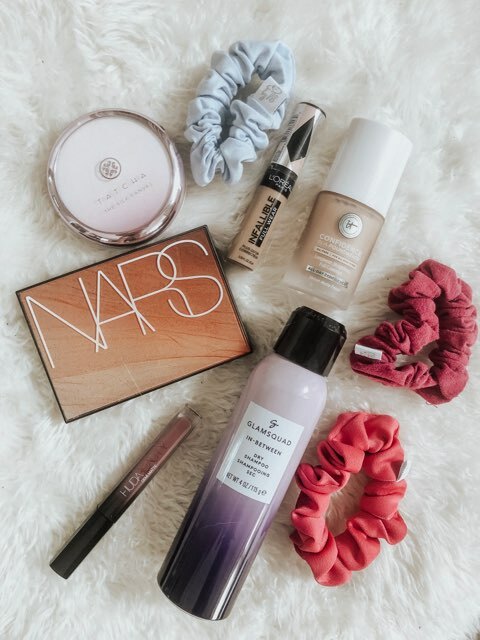 Caroline loves the Mac Prep + Prime Fix + setting spray. The nozzle is amazing and distributes the spray evenly on your face. It’s lightweight and keeps your makeup in place all day. What’s great about this product is that it comes in different scents and colors! They have romantic rose, creamy coconut and calming lavender in addition to their original soothing herbal. 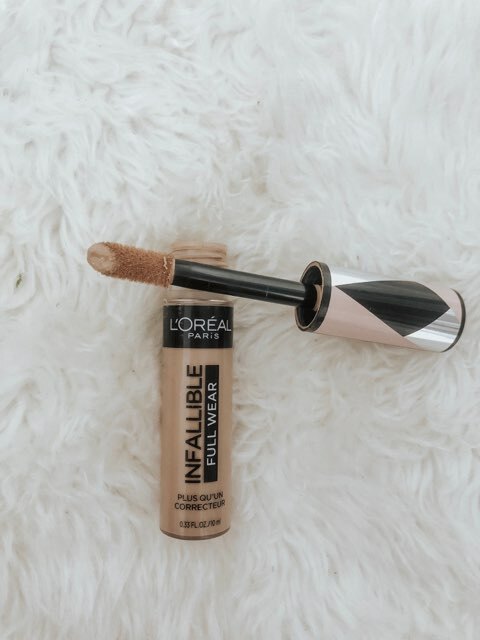 Their products tend to run more on the expensive side, but they make travel size bottles for most of their popular products so this one is perfect to try if you’re on the fence! If you’re looking for a quality setting spray that won’t break the bank, the Sephora brand beauty amplifier set and refresh spray is for you. I love Sephora brand makeup for this reason because it’s quality yet inexpensive makeup. This setting spray doesn’t dry out your skin yet keeps your skin’s moisture in. I have naturally oily skin and this setting spray doesn’t leave my skin feeling oily! Another inexpensive yet quality option is the NYX matte finish makeup setting spray. I first tried this when it was in an Ipsy box I received and I loved how small it was. It’s a perfect travel size setting spray. 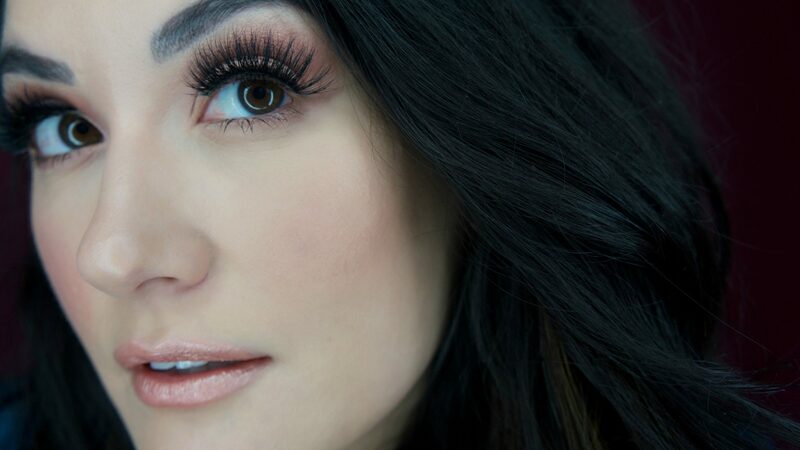 This is a “fan fave” on Ulta’s website, so you can’t go wrong with trying this one out! Wet and Wild is another great brand that won’t break the bank. Their “photofocus” setting spray goes on smoothly with a nice spray nozzle that sprays evenly over your face. Bonus, it’s cruelty-free AND under $5! Last but not least, Elf is such a great makeup brand. Their products are affordable and great quality. 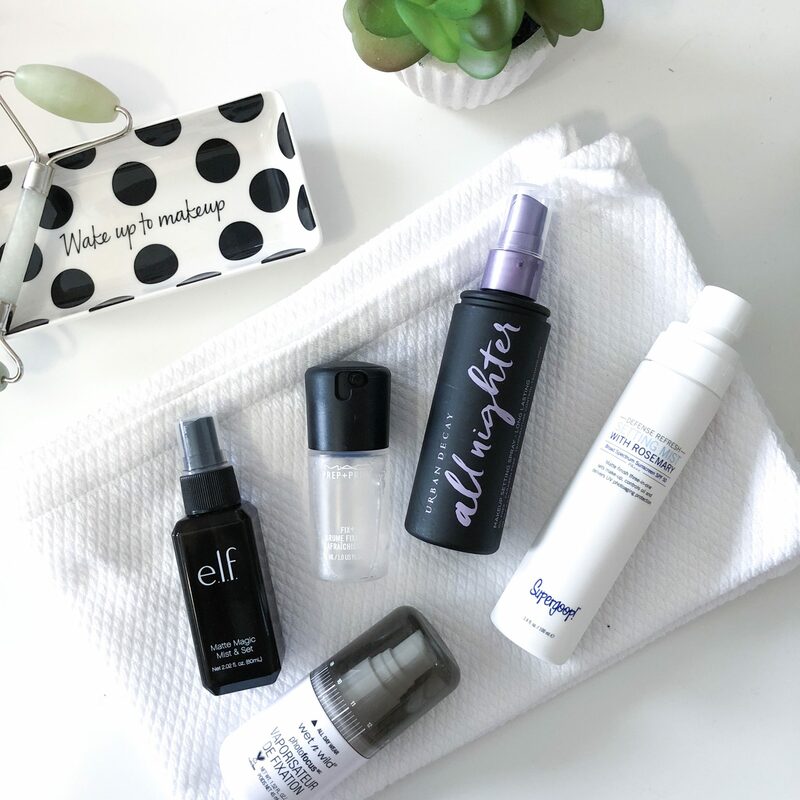 Caroline has been using the Elf “matte magic mist and set” and loves how it keeps her makeup in place all day long. And for $4? You can’t beat that! You can even pick this up at your local drugstore if you’re traveling. 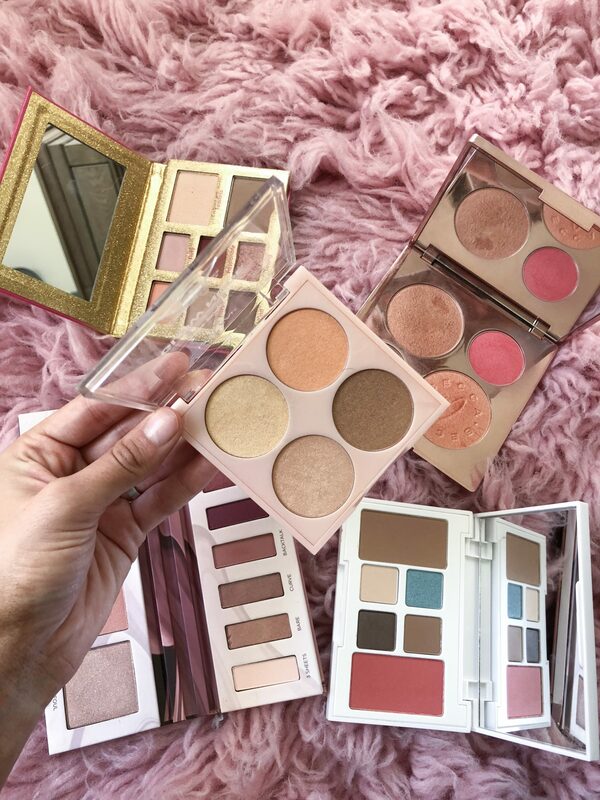 I went through my FAVORITE makeup palettes I have and currently love and wanted to share which ones I believe are a MUST have. You know, the ones with face, eye and maybe even lip included. I’ve linked different ones from Sephora and Ulta, depending on where you shop. 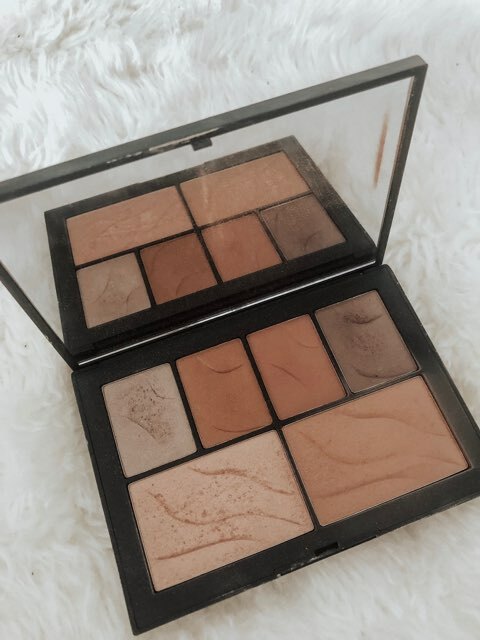 If you’re looking for a palette and would like a link that isn’t below, let me know! 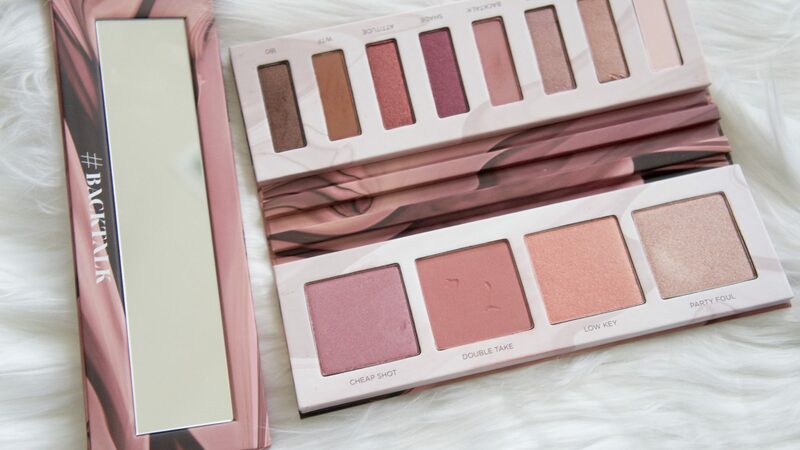 I love finding a palette that has everything you need. Some have the basics and some have everything you’d need for a complete glam look. I personally love the ones that have the basics and are easy to travel with, whether that means small in size, has everything I need and or comes with a mirror. It’s currently on sale for only $19, marked down from $32. You can purchase HERE. Any of these would be perfect to add into your routine – every one of these I personally own and love. I have linked them all above for you. If you’re looking for a certain product or have any questions feel free to leave them below! 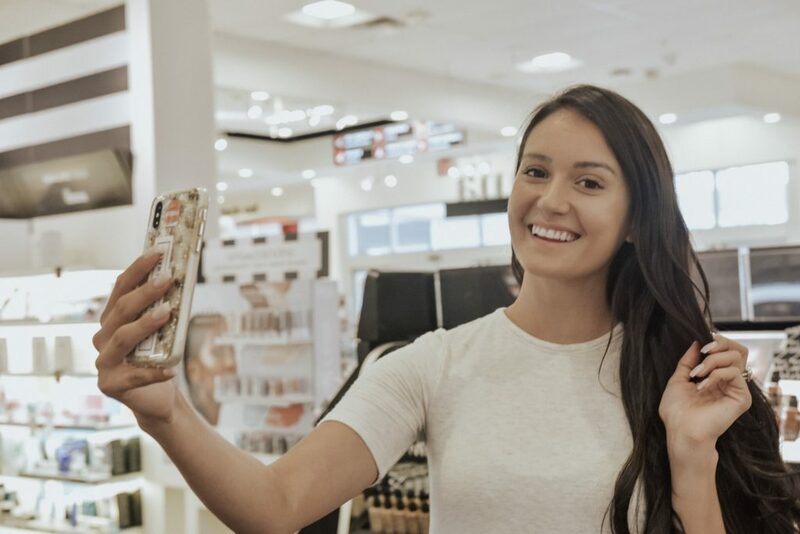 Sephora inside JCPenney: New + Trending Makeup Look! 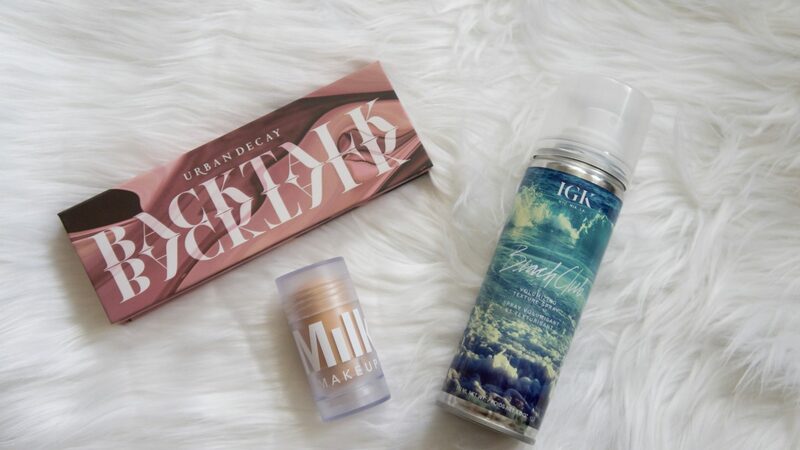 I partnered with Sephora inside JCPenney to share some of the latest and greatest pieces from Urban Decay, Milk Makeup and IGK. I had so much fun playing today with these products, below I will go into more detail on each as well as sharing my completed look. The Milk Makeup Blur Stick is INCREDIBLE. Not only does is smell delicious (don’t eat it, trust me it’s tempting but don’t, haha.) it helps minimize your pores, which HELLO, we all want that! I’ve been dying to get my hands on the new Backtalk Palette from Urban Decay!! 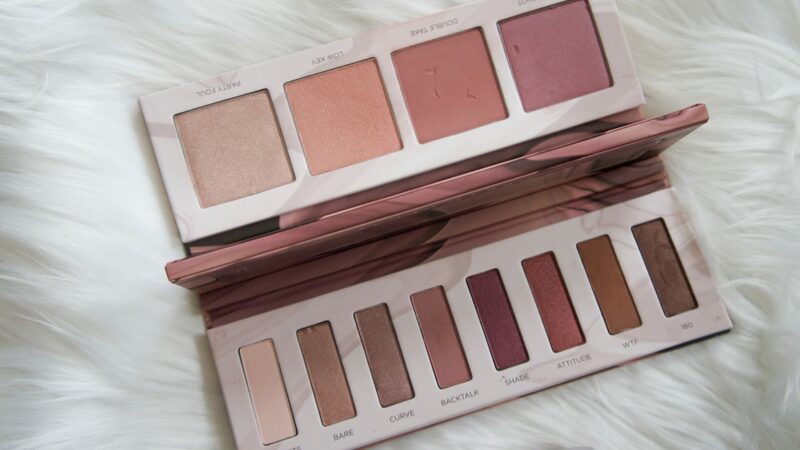 Urban Decay based this palette on their number one selling lipstick called “Backtalk”. 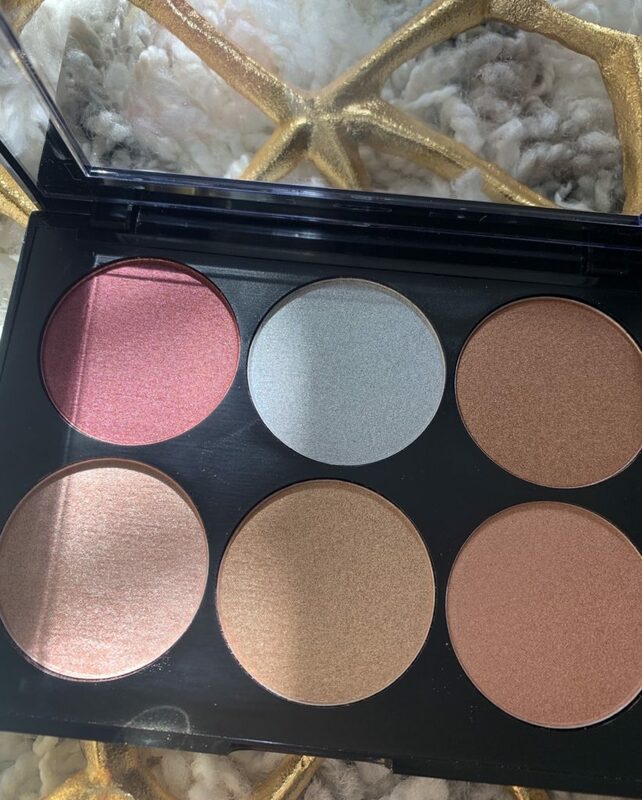 Taking that color and creating a palette that is easy to pack in your bag, use for multiple reasons and it also has a portable mirror you can pull out which is seen as a divider. You will see below! See how the divider turns into a portable mirror? Genius! Whomever thought of that is amazing. It’s an easy way to dive into the palette and also be able to use the mirror as you please. 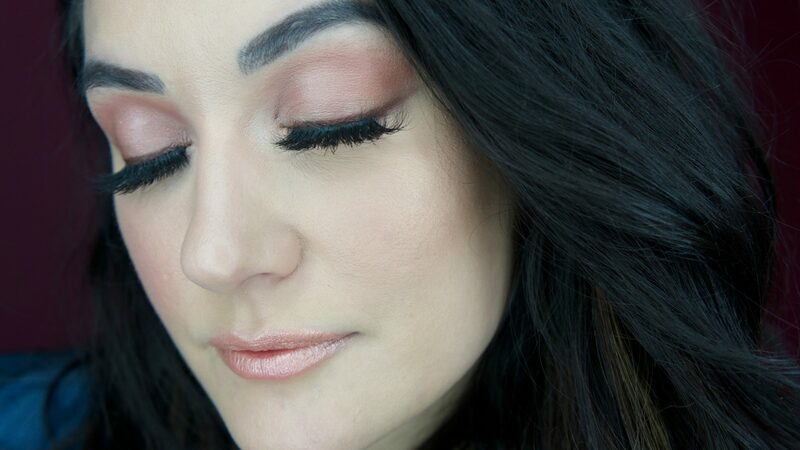 You can easily create a soft blush look, a pink smokey eye, blush, highlighters as well! It’s easy to create your office look or night out with your friends look. Each color feels velvety and blends so smoothly. You can pick this up at your local Sephora inside JCPenney for $46. My hair is very thin at my roots and I wanted to try the IGK Beach Club Texture Spray, I found it gave me the volume I needed but not to the point where I couldn’t run my fingers through my hair. I’ve tried texture sprays before and they seemed to be too sticky. I was very pleased by the texture it left my hair in and also no residue. IGK Beach Club Texture Spray is $29 at Sephora inside JCPenney. 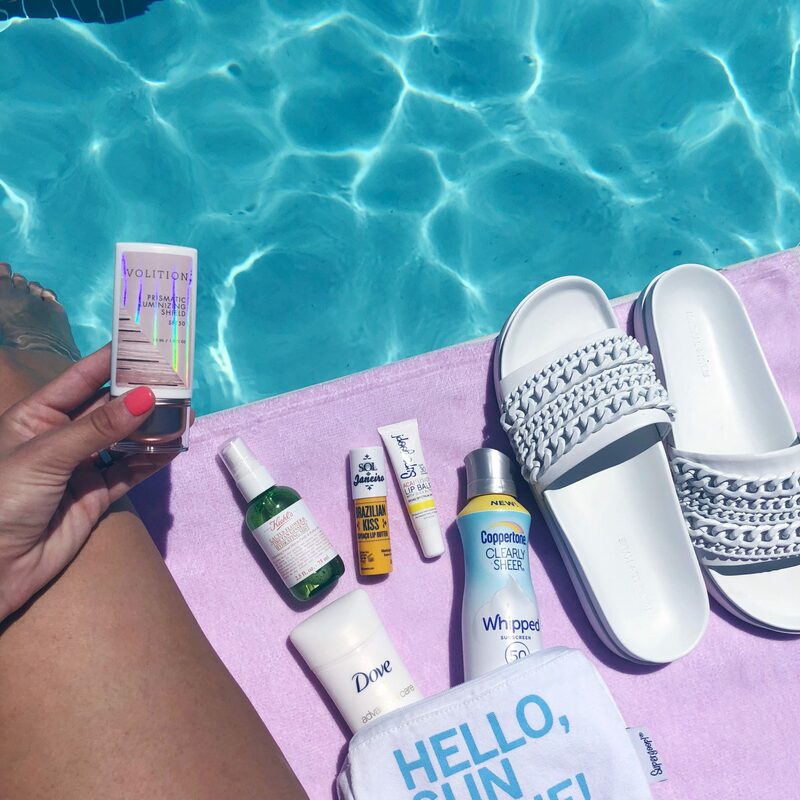 I hope you got some summer glow inspiration with this post! 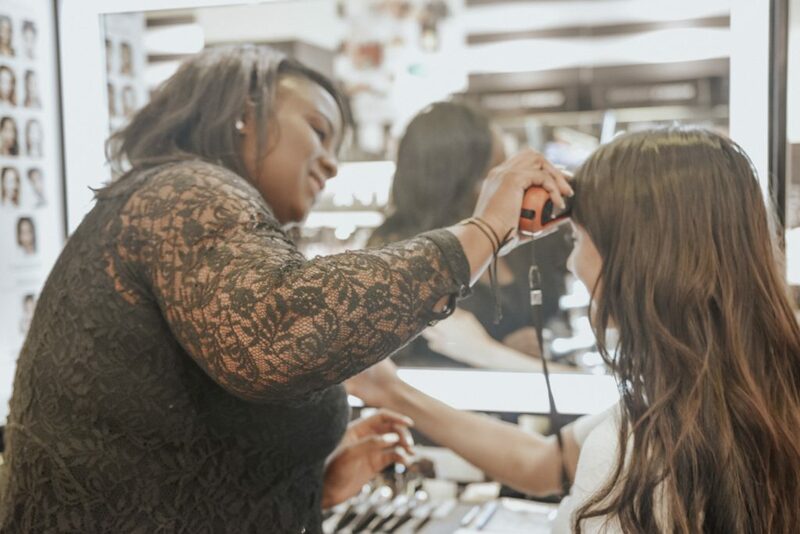 Whether it’s a day look you create or fun glam look, stop by your local Sephora located inside JCPenney to find all of the newest and greatest products. They have everything you’ll need for your Spring and Summer looks. Exciting things happening! 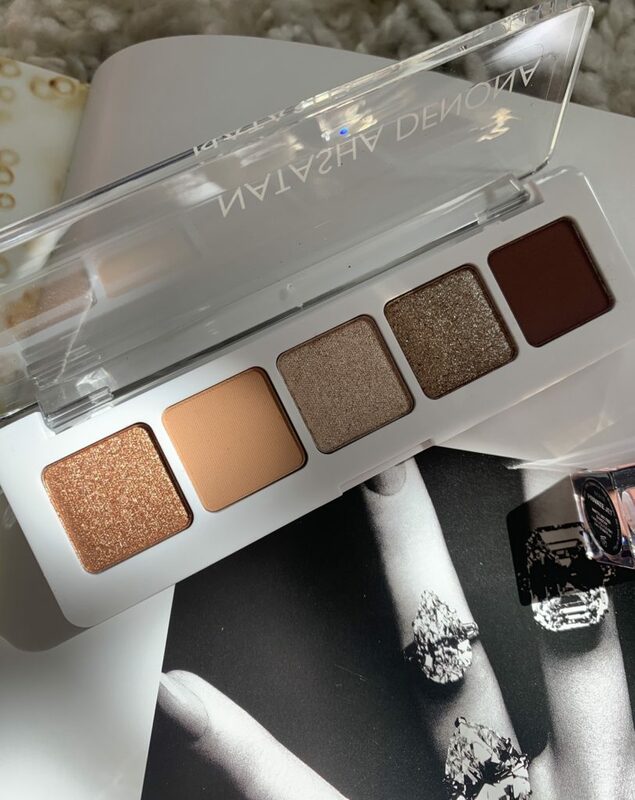 Many of you have tried some of the products from Fenty Beauty, but have you SEEN the new products yet?! I am SO pumped! In collaboration with Sephora inside JCPenney I will be showing you how I styled three different outfits from JCPenney with three different colors from Fenty Beauty’s Mattemoiselle Lip Collection which I got at Sephora inside JCPenney too! JCPenney opened Sephora inside JCPenney at their stores in 2006 and they are doing big things! High quality clothes AND high end beauty products in one place?? YES PLEASE. 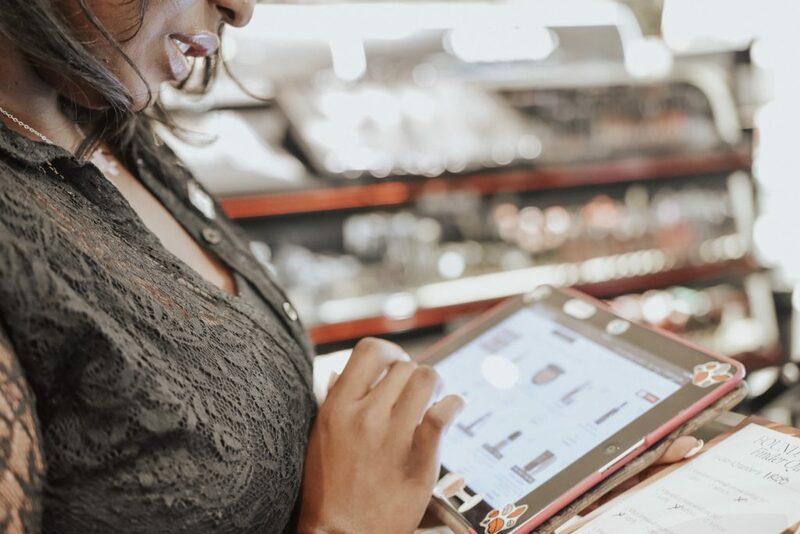 It’s a great way to get everything you need to shop for in one place. 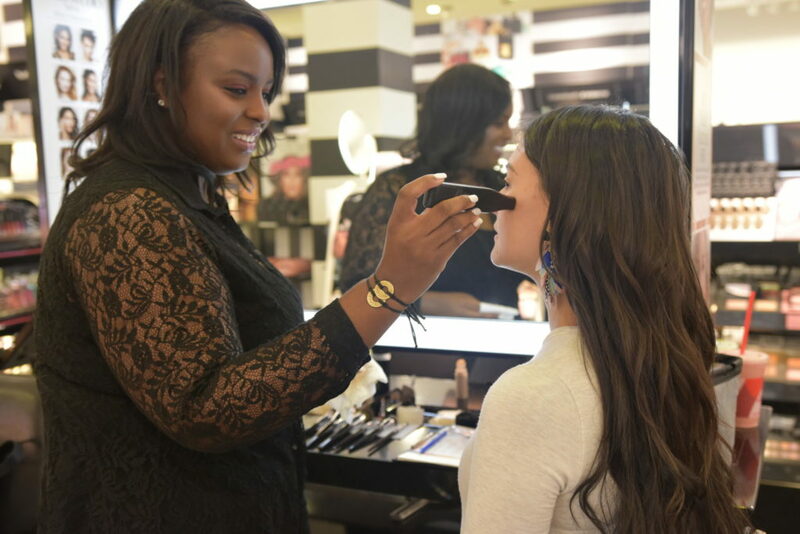 Sephora inside JCPenney also offers free mini-makeovers at their locations! Guess who got to go in-store and try the new Fenty Beauty Mattemoiselle line? YES, ME! This line has 14 amazing, matte lipstick shades that will seriously leave you speechless! I decided to do 3 different outfits with my #FentyFace and match 3 fun colors from the Mattemoiselle Collection. 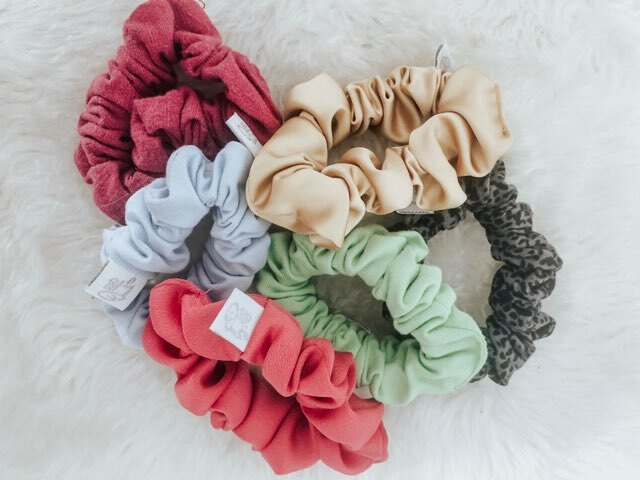 Click HERE to check out all the colors! Below, I have on this Project Runway Knot Waist Sweatshirt Dress (perfect for chilly days). I love the details in the middle of this dress because it accentuates my waist and my curves. Sometimes, in the winter, we end up of losing our shape with all of the thick clothes and layers we have to wear to stay warm! Comes in 2 colors: Purple & Grey. I’m wearing a size small. Currently on sale for under $30! I decided to pair this outfit with the Mattemoiselle lipstick in the shade “Griselda”. I think this lip shade ties the outfit together nicely and isn’t “too girly”. Link to shop is HERE. Also wearing these awesome suede, knee high boots from Liz Claiborne! I am obsessed with these boots. I always have a hard time finding a pair of boots that don’t slouch down while walking, these stay in place! Link to shop is HERE. Currently 80% off!! No joke, $20! If you have heard anything about Fenty Beauty at this point, you know that Rihanna is killin’ it when it comes to quality! And above all- she actually made products for ALL skin types and shades. No, seriously…all of them. A lot of brands claim to be all-inclusive, but end up falling short. Not this line! The colors are SO rich and yet still light and wearable! And the shades go from light to dark, and everything in between! Click HERE to shop the Fenty Beauty Pro Filt’r foundations. The second outfit I put together has more contrast. I LOVE contrast in my outfits, and these Mattemoiselle shades will have plenty of options for that! SO, can we talk about these bell sleeves?! This blouse is from T.D.C Funnel – The sleeves are the perfect length so I still feel comfortable going out to eat and not getting food all over! Yeah, I’m clumsy! So what?! Haha. They currently have black in stock. I’m wearing a size small! I paired this top with black pants from BELLE + SKY and, yep, those suede knee high boots, again! I told you I love them! The Mattemoiselle lipstick Plush Matte lipstick shade I went with for this outfit is “Shawty”. I swear, the names of these lip colors are almost just as awesome as the line itself! I chose this shade because it’s a much darker color and it looks awesome against a white top. Plus, it made my outfit just a bit more edgy. Click HERE for the lipstick! My third outfit was honestly my favorite and kind of out of my comfort zone — which is why I’m releasing how much I loved it. I was challenged to pick an outfit I usually wouldn’t wear and pair it with a color lip I haven’t done before either. Challenge taken and I’m in love!! 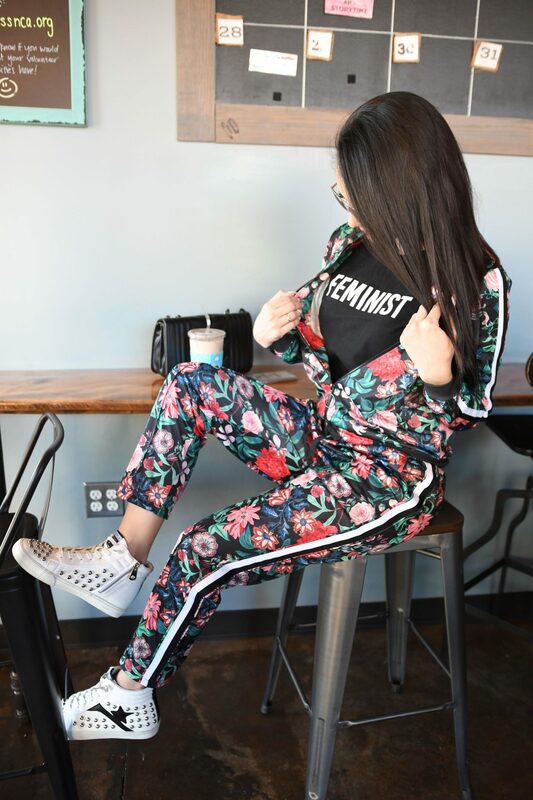 I rocked this killer floral track suit with my feminist t-shirt underneath. Don’t you just love this? I now wanna wear this jacket all the time. Project Runway Floral Bomber Jacket – it’s currently on sale – under $20!! Click HERE to shop the jacket. Project Runway Floral Track Pants – also on sale – under $35!! Click HERE to shop the pants. My feminist t-shirt is also from the Project Runway Line! It’s currently under $10. Click HERE to shop this graphic t-shirt! For this look I wanted to pair it with a FUN & in-your-face color! I picked “One Of The Boyz” — it’s a gorgeous lilac color. I’m glad I tried something I normally wouldn’t. 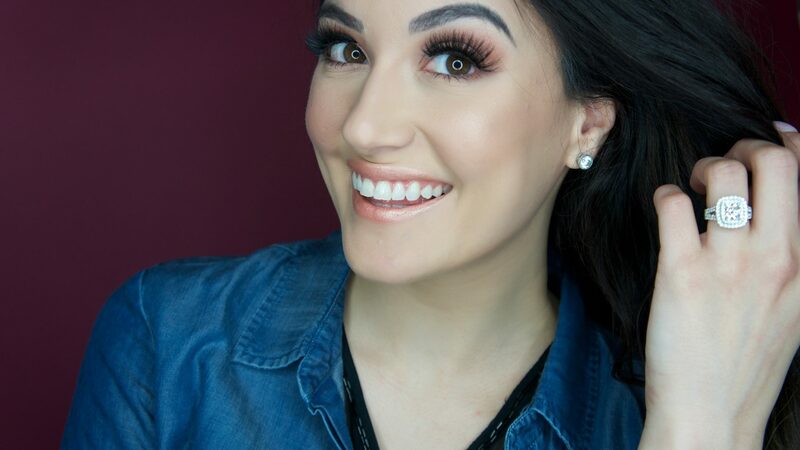 It made me want to explore more when it comes to colors in my makeup routine! 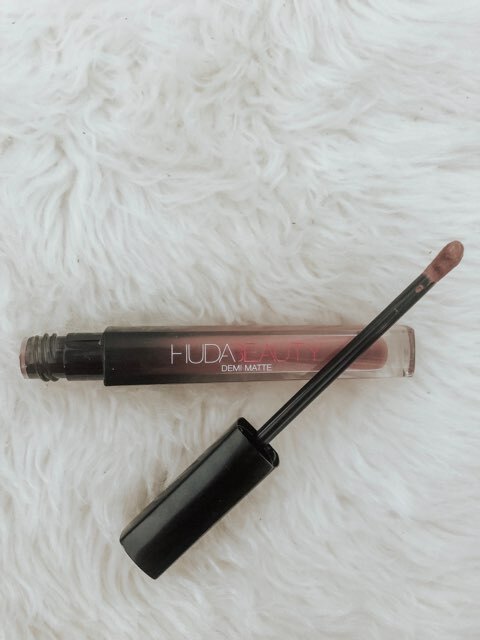 Click HERE to shop this lipstick! Don’t forget to enter the fun giveaway that is on my Instagram. Below is a direct link to enter to win a $100 giftcard to Sephora inside JCPenney!!! !